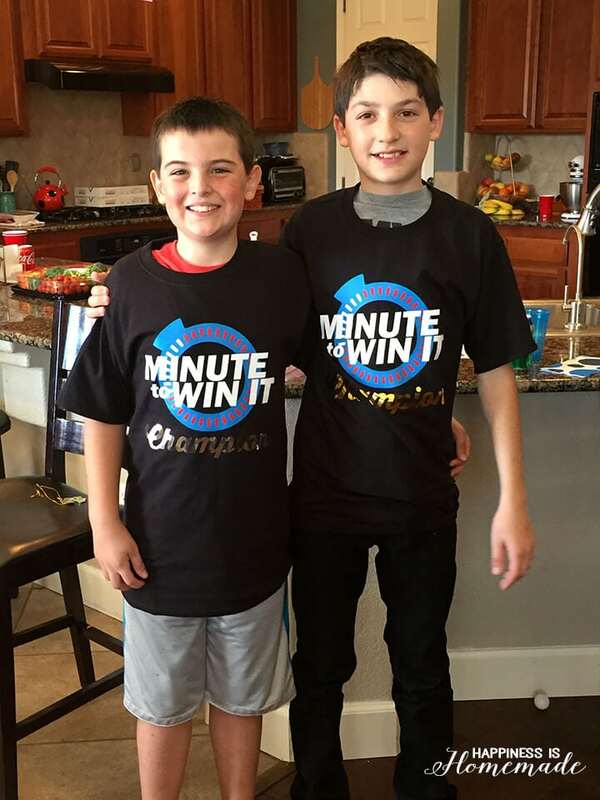 We recently celebrated my oldest son’s 9th birthday with a Minute to Win It themed birthday party, and it was a TON of silly fun! 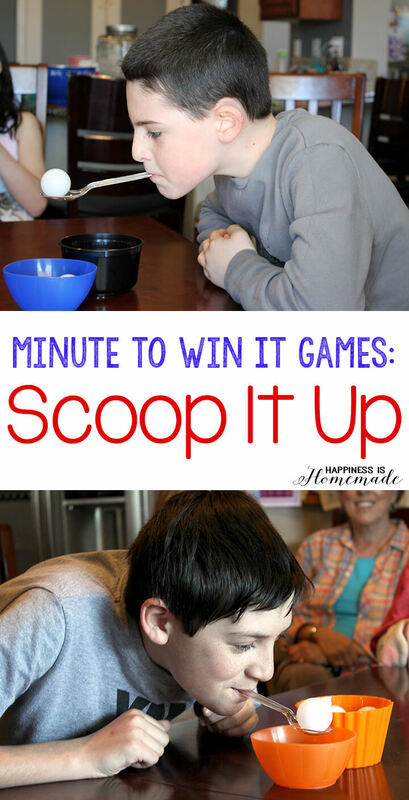 These 10 Minute to Win It games were perfect for all ages (we had guests from ages 4-55 playing these games, and everyone had a blast!) – challenging enough for the older kids and adults, but still simple enough that the younger children could play as well. 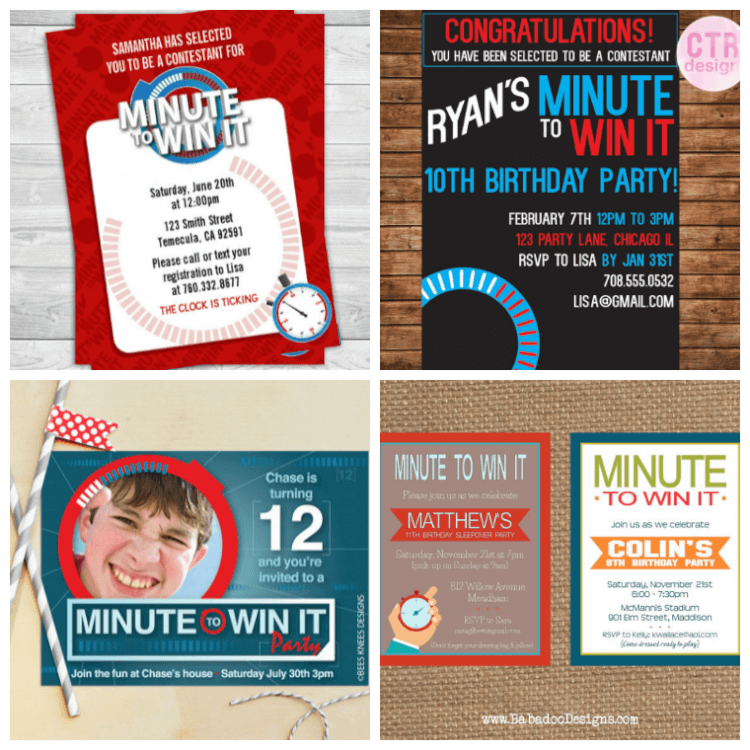 We found some great invitation choices on Etsy (clockwise from top left): Minute to Win It party invitations by Candles and Favors, Minute to Win It printable invitations by CTR Design, Minute to Win It Invitations by Babadoo Stationery, and Minute to Win It Invitations by Bee’s Knees Design Shop (in boy or girl colored designs). The score keeping was simple: If a player attempted the game he/she automatically received 3 points, and if they were able to complete the task in under a minute they received 5 points. The top two point totals won the gold and silver prize at the end of the games. 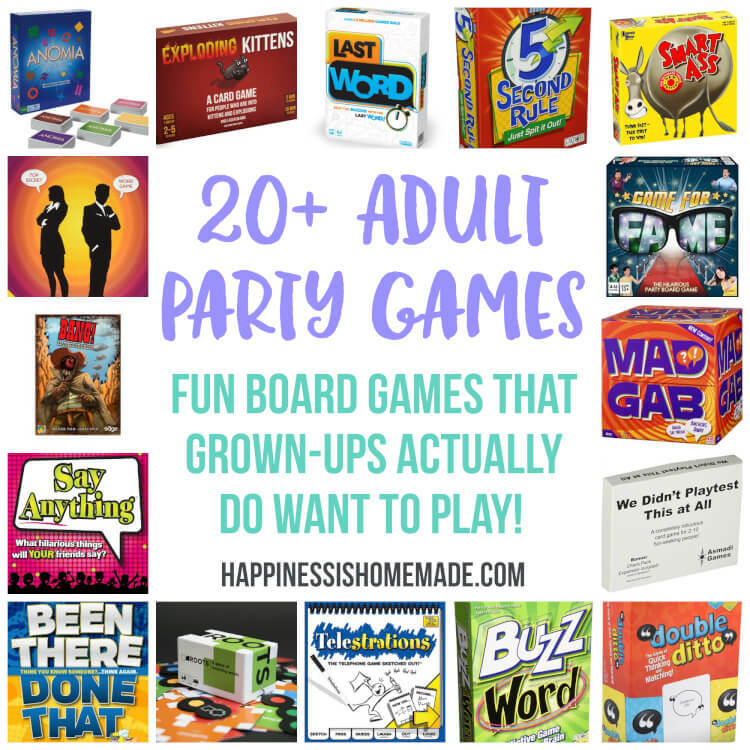 This is a great game to kick off the party because all of the players can compete at the same time (or you can break it down into several rounds of game play). 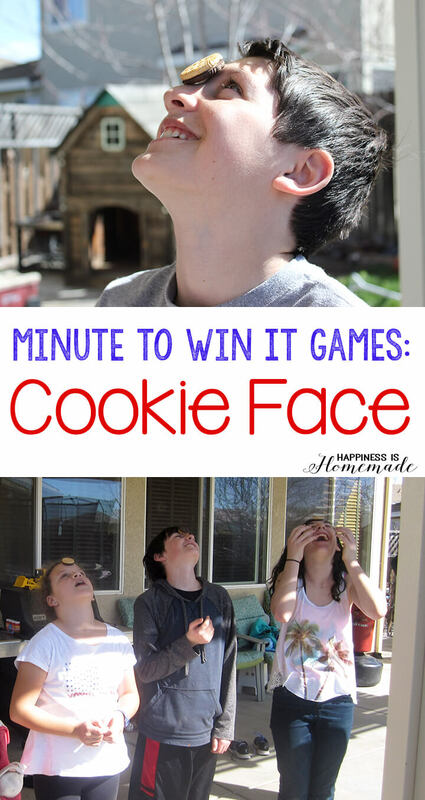 Each player places a cookie on their forehead, and the goal is to get the cookie into your mouth using only your facial muscles in under 1 minute. No hands! This is tougher than it looks! Players must stack 25 pennies in under a minute using only one hand. This game works well with 3 players competing in each round of play. Players place a straw in their mouth and use suction to transfer a pile of 25 M&M’s from one plate to another in under one minute. Only one hand may be used to hold the straw. Everyone gets to eat their candy when the round is finished! This game also works well with 3 players competing in each round. Pong Tac Toe was one of our guests’ most favorite games – some of the adults even asked if they could do play it twice! We used three trays from the game Bounce Off Party, and assigned one to each of the three players. 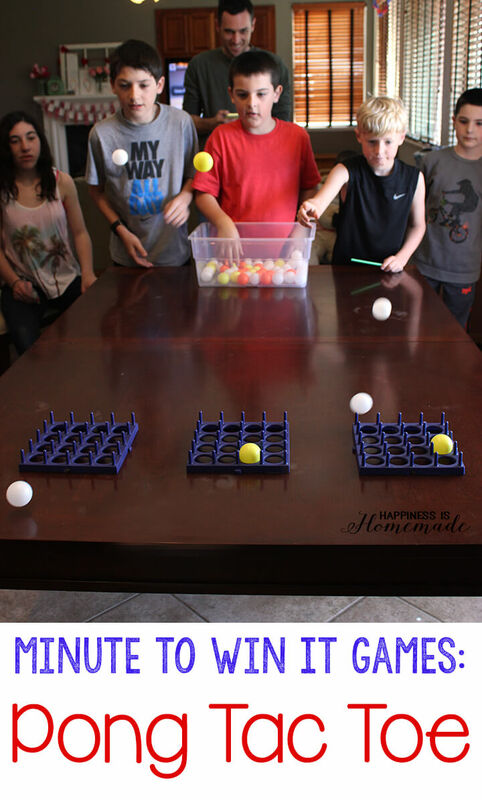 Each player had one minute to bounce ping pong balls down the length of the table and into their tray – 3 in a row (in any direction) wins! Players have to stack up a pile of cups and then place them back into a single stack in under a minute. The original Minute to Win It version of this game calls for 36 cups to be stacked, but we reduced the number of cups for the children. Each child stacked 21 cups, and we discovered that this was the perfect number that resulted in exactly half of the kids being successful. Challenging, but not too challenging! Two players competing in each round works well so that any falling cups won’t knock over your competitor’s stack, too! Using nothing but a spoon in your mouth, transfer six ping pong balls from one bowl to another) in less than one minute. No hands! Hands are only allowed if you drop the ping pong ball, and then they can be used to place the ball back into the original bowl for another transfer attempt. 2-3 players compete for each round of play. Each player starts with a stack of 25 red cups with one blue cup at the top of the stack. Start by moving the top blue cup to the bottom of the stack, and continue moving cups from the top to the bottom until the blue cup is back at the bottom of the stack again. 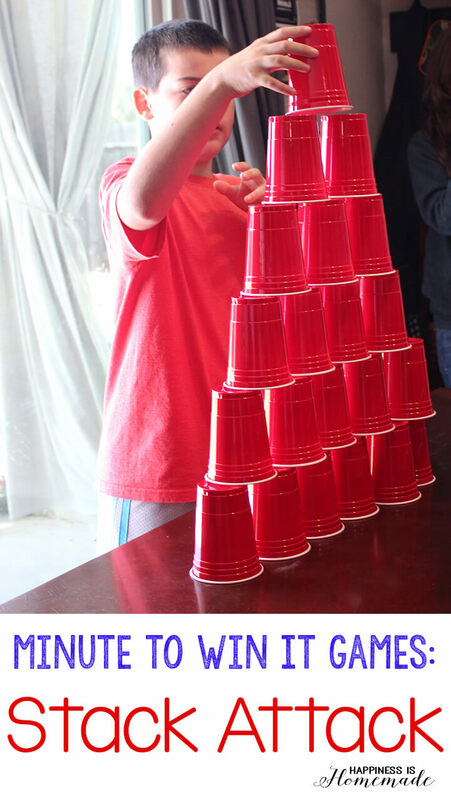 Again, we modified this from the original adult version of the game that calls for 40 cups, and found that 26 cups was a great amount for the kids to work with. 2-3 children per round of competition works well. Thread five hex nuts onto a wooden skewer. Using only one hand on the skewer, stack up all of the nuts in under one minute. Since this game requires the table to stay as still as possible, only two players compete per round. This game was another crowd favorite! To prepare for this game, empty a tissue box, and use an Xacto knife to make two slits into the bottom of the box. Thread an adjustable belt or wide ribbon through the two slits to create a tissue-box-on-a-belt. Removing the thin plastic barrier from the tissue box opening will make game play easier (for younger children) or keep it intact for more challenging play. Using only one hand, players must keep two balloons from touching the ground for one minute. For a more challenging game, increase the amount to three balloons per player (and use different colored balloons for each player to make it easy to differentiate!). No holding the balloons! 2 players per round of competition worked well to give the players ample space to knock their balloons around. I used heat transfer vinyl from Expressions Vinyl in white, bright red, sky blue, metallic gold and metallic silver to create our “gold medal” and “silver medal” grand champion prizes. 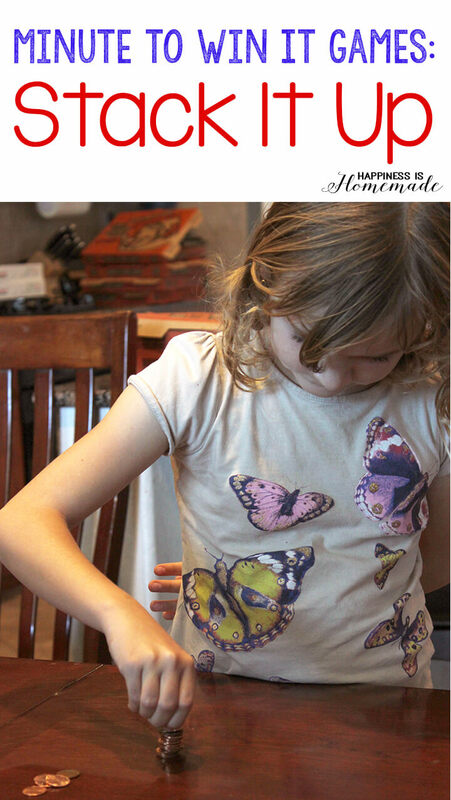 More more how-to details on layering vinyl, check out my post on DIY custom t-shirts here. The birthday boy was SO happy to be one of the grand prize winners, and they both loved their shirts! Everyone had a blast playing these fun Minute to Win It Games, and all ten games took 12 kids about an hour and a half to complete. 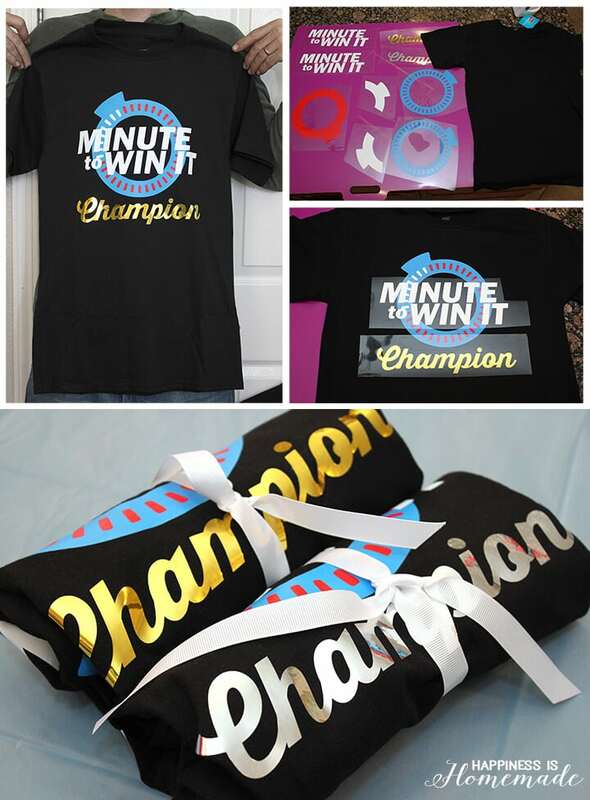 Aside from the two grand prize winners receiving their special “Champion” shirts, each player also received a blue prize ribbon and a goofy “prize money” necklace. 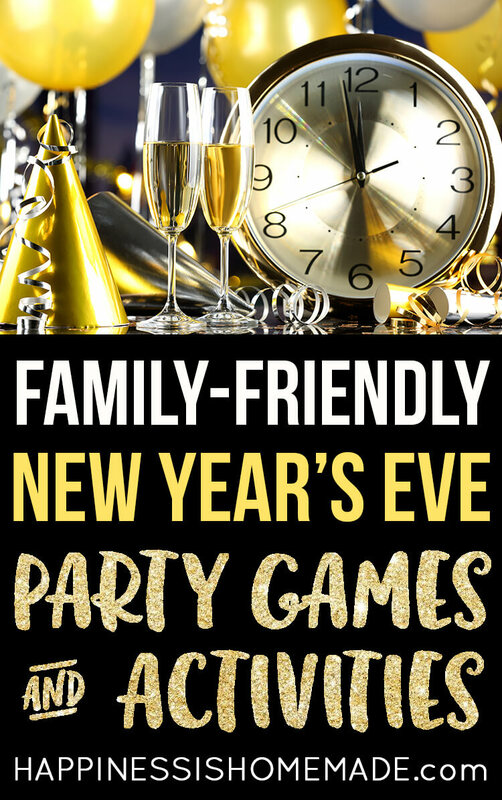 This was an incredibly fun party, and it was actually quite inexpensive to host, too! 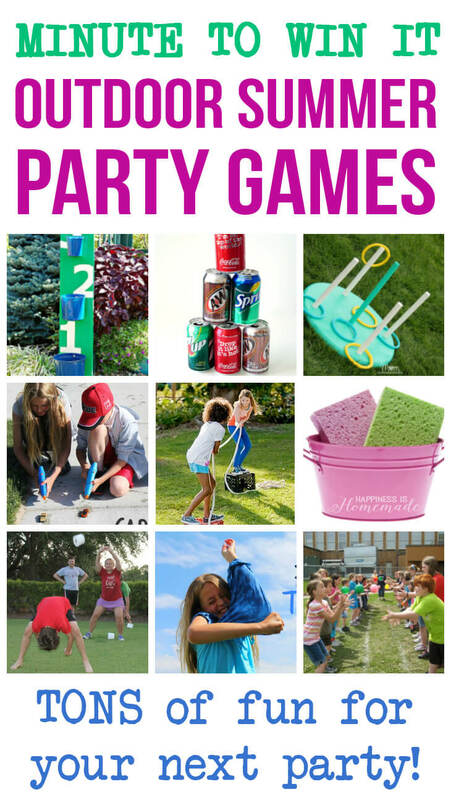 Check out These Posts for Even MORE Fun Party Games! 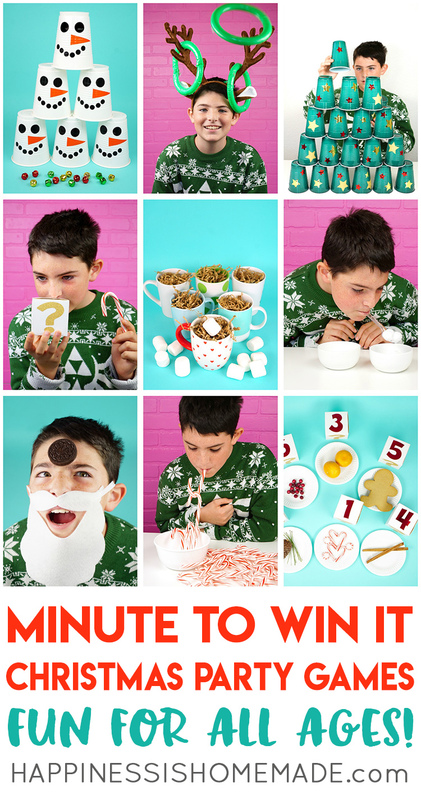 MORE All-Occasion Minute to Win It Games for All Ages! 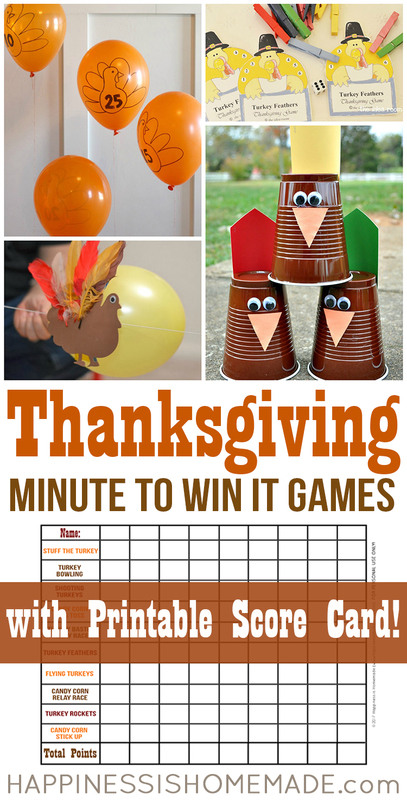 Thanksgiving Minute to Win It Games with Printable Score Card! Just wanted to say thank you for this. I’m organizing a games night for some kids at my church and this list was incredibly helpful. Love them! Simply fabulous! I loved your ideas. I thought it was very healthy and fun. Te super felicito!! Fabulous!! Love the ideas and the great descriptions and photos! Just a note to add, if you don’t have the Bounce Off Game you can use a muffin tin! (the bounce Off party game is out of stock right now..) Thanks for these great games for our daugther’s 9th bday! Fantastic ideas! My soon to be 10 year old twins have a November birthday and it is always hard to find ideas to keep the children busy indoors. These are perfect and I like that they will appeal to boys and girls alike. Great post! Saw it while browsing Pinterest this morning. My husband made up the games for Minute to Win It (he was the show’s games producer and later executive producer) and I love seeing families have fun with his creations! Thanks for all the great ideas! We ended up using 18 egg egg cartons cut in half for the tic tac pong. Four people played at a time with all of the ‘boards’ close together so that other people’s ping pong balls could actually hit other people’s boards. It was one of the favorites. 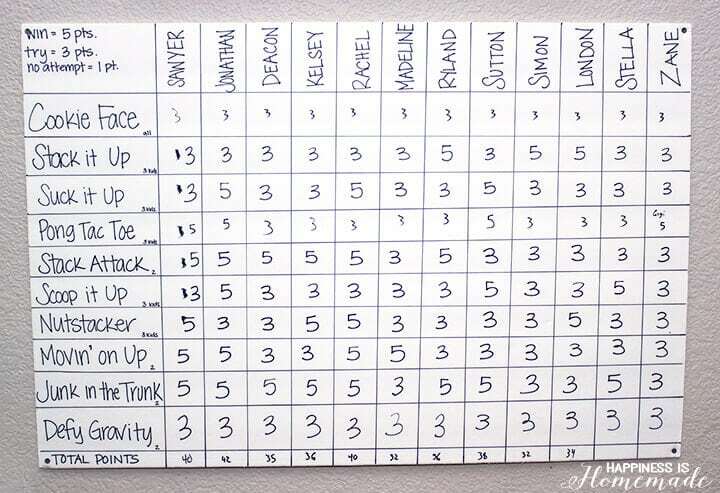 I loved your scoring idea and used it at our New Year’s party. We had people from 2 – 48 all playing the same games. It was really fun! Wow, I’m so glad I found this! I’m a school age manager at a centre where I look after 12-22 school aged boys on any given day. This should definitely keep them busy, thanks!! So many amazing ideas! I popped by for an idea or two… now how will I choose?! Thanks for the great post. Thank you so much for this post. Your directions, supply list, score chart etc. all saved me so much time! 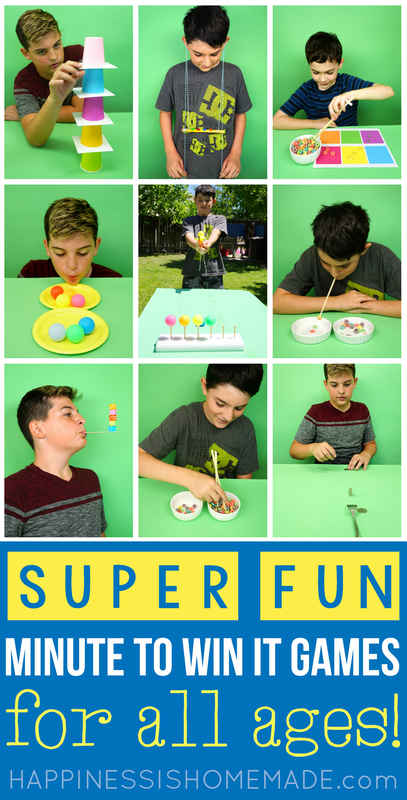 I used 8 of these for my son’s recent 13th birthday and it was so much fun, low cost and low stress! Thank you so much for sharing these ideas! They look fantastic!!! My son will be so excited to play these at his party! Hi Heidi! 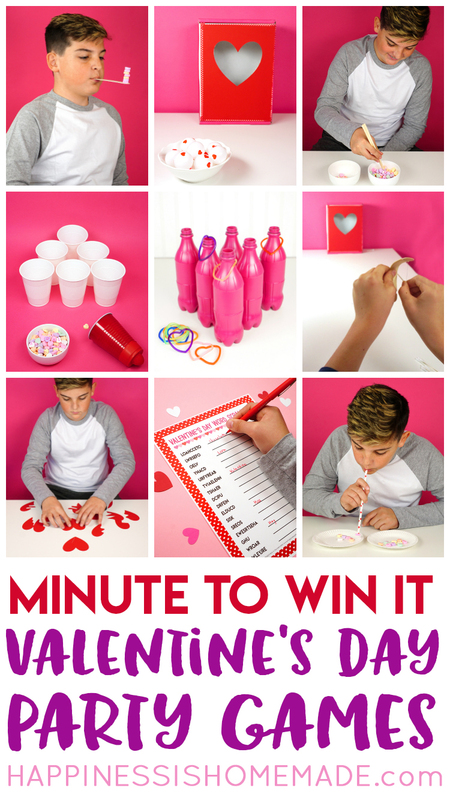 I was researching minute 2 win it games for my upcoming 11th birthday, my sister showed me your website, and it’s perfect! Your ideas are awesome and I’m glad you shared them. Thanks again! That is a good idea doing these games for your birthday. These games are so helpful!!! I’m going to use them for my school’s chapel minute to win it games! I was a bit stressed because I, a middle schooler, have to organize a chapel with two other middle schoolers and this website is helping me find fun, easier games for my peers vs. teacher games. Thank-you! These are awesome! We also love the sticky note on the face game. Thank you so much for the ideas! We are doing our own youth camp from church and I would love to make the winners a shirt. Would your minute to win it vinyl transfers be for sale by any chance?